In the early 90s, the NHL continued its program of expansion, both in size and geography. Previous markets in the Bay Area and Ontario became targets, and the long sought after potential fanbases were also finally tapped. Unlike many expansions, the three teams below are still going strong, and still in their original cities. While this expansion hasn’t seen the same cup success as the 1972 expansion (two teams & four Stanley Cups), the Tampa Bay Lightning are well on their way to building to building a dynasty. Since the Cleveland Barons folded in 1978, there had been an odd number of teams in the NHL. The addition of the San Jose Sharks in 1991 restored the balance. The SAP Center wouldn’t open until 1993 so the Sharks played their first two seasons in Daly City’s Cow Palace, the former home of the San Francisco Seals. The Seals were part owned by Gordon and George Gund, and when a request to relocate the Minnesota North Stars to the Bay Area (it’s a long story) was denied; the Gunds sold their shares and were allowed to set up a new expansion team. And thus the Sharks were born. The Sharks’ first two seasons were miserable. The team posted a .21 win percentage in their first season, and .13 in their second. Despite terrible performances on the ice, the Sharks sold out every game at the Palace. Once the team moved to the then San Jose Arena in 1993 their fortunes changed. In the 11 seasons between moving houses and the NHL’s whole season lockout; the Sharks made the playoffs eight times, once progressing as far as the Conference Finals before falling to the Calgary Flames. While never troubling the Stanley Cup, San Jose were developing into a solid team, albeit with a few hiccups along the way. Players like Todd Elik, Sergei Makarov and Igor Larionov regularly led the team in points. In 1997 Darryl Sutter was brought in to steady the ship. In the same year Patrick Marleau was drafted and is currently the franchise’s all-time points leader. As the 2000s appeared; Owen Nolan, Vincent Damphousse and Jeff Friesen were melting the ice with their performances, but compared to others, the Sharks were not contenders. Despite never missing the playoffs during his tenure, Sutter was fired just 24 games into the 2002/03 season. For a relatively young team (younger than me anyway), the Sharks have gone through more rebuilds than a box of Lego. In 2003 Ron Wilson took the helm, players were traded and GM Dean Lombardi was fired. That revitalized the team and the 2003/04 season was a stormer, the Sharks won the Pacific with 104 points and made it to the Conference Finals. 2005/06 wasn’t quite as strong but still respectable. The Sharks were bolstered by the arrival of Joe Thornton from Boston at the expense of Marco Sturm, Wayne Primeau and Brad Stuart. The trade was an instant success for San Jose, but Cup success still evaded the team and that cost Wilson his job. Todd McLellan then stepped in but again was unable to progress the team. After parting ways in McLellan in 2015, Peter DeBoer was given the head coach role and in his first season took the Sharks to their first Stanley Cup Final. The LA Kings, Nashville Predators and St. Louis Blues all fell before the might of Marleau, Thornton and Pavelski’s offence, and couldn’t breach Brent Burns‘ blueline. The Pittsburgh Penguins could, and did, winning the finals in six games. The original Ottawa Senators left Canada’s capital city in 1934 and the NHL completely just one season later. When Bruce Firestone founded his expansion nearly 60 years later he resurrected the name because nostalgia or something. Like their Tampa Bay expansion brethren, and pretty much every other expansion team, the Senators’ first few seasons were poor. Both on the ice and off it. The quest to draft Alexandre Daigle led to the team being fined for comments about tanking, and a ridiculous $12.5 million rookie contract. Once referred to as maybe the “most scumbaggiest team of them all”, the Senators took five seasons to reach the playoffs, although that first appearance in 1997 would be the first of 11 consecutive visits. To reach this level of respectability the team went through some early teething troubles. GM Mel Bridgman lost his job and superstar Alexei Yashin was holding out on his contract. The move to the Palladium in 1996 really ignited the Senators. At the same time Daniel Alfredsson was finding his stride and was well on his way to immortality in Ottawa (and a footnote in Detroit). Alfredsson would go on to set most of the Senators’ records including regular seasons goals, assists and points, highest +/- and a horde of others. But he couldn’t bring that long sought Stanley Cup. The Sens’ best chance at the cup came in 2007. It was a bizarre season; the Sabres won both the Northeast Division and the Eastern Conference, but Ottawa went 48/25/9 to finish second in the division and comfortably clinch a playoff berth. The Pittsburgh Penguins were defeated in five games in the first round, as were the Devils in the second round and the Sabres in the Conference Final. The line of Jason Spezza, Dany Heatley and Alfredsson scored almost half of the team’s goals. As May 2007 rolled into June however, things were not going well. The Anaheim Ducks had taken the first two games at the Honda Center and despite winning game three at home, the Sens lost game four and the series returned to California. On June 6th, the Ducks thumped the Senators 6-2 and lifted their first Stanley Cup. The loss cost GM John Muckler his job, and was replaced by then head coach Bryan Murray. The Sens have had a few coaches since Murray went upstairs, Paul MacLean won the Jack Adams trophy in 2013 after taking the team to eh conference semifinal, their highest achievement since 2007’s finals. He was fired in 201 and replaced by Dave Cameron who coached two good regular seasons, but failed to translate that success to the playoffs. Guy Boucher has been behind the bench since May 2016. After a few decades of trying, in 1992 the state of Florida finally got an NHL team and, boy, the first 10 years were grim. Just once did the Bolts get a sniff of the playoffs, and they were knocked out in the first round by the Philadelphia Flyers in 1996. The Tampa Bay Lightning were from a blaze of publicity, Phil and Tony Esposito led the charge to bring a team to Tampa and when the NHL agreed, Phil became President and GM. Former Calgary Flames coach Terry Crisp took the head coach role. Tampa’s Expo Center was the team’s first home, but due to being only slightly bigger than a mid-size sedan the Bolts moved to the Suncoast Dome, renaming it “The Thunderdome”. The front office struggled to manage the franchise effectively almost from the start. After the Bolts forgot that paying tax is a thing that happens in Florida, the IRS came a-knocking. In 1996 the Lightning moved to their current home, the then named Ice Palace. During the 1990s Tampa continued to draw in the fans, but the front office’s management was just a dumpster fire of terrible decisions. Many money-saving trades later, Phil Esposito stepped down in 1998, leaving the team with one playoff appearance and $102 million dollars worth of debt. The team was bought and then sold again a year later. Ownership issues would only settle down in 2010, when current owner Jeffrey Vinik bought the team for $170 million. Fast forward a few seasons and the situation looked promising. John Tortorella took the head coach role early in 2001 and in 2003 took the team to the Conference Semi Finals. The Lightning were defeated in five games by eventual champs, the New Jersey Devils. The 2003/04 season was better and the team finished the regular season with a franchise high (at the time) 106 points. Tampa defeated the Islanders in five and swept the Canadiens. The Flyers took the series to seven games but the Lightning held on to progress to their first Stanley Cup final. The Flames didn’t make it easy, game six of the series went took two overtime periods to be decided. Martin St. Louis scored in the powerplay to bring the series to 3-3 and force a game seven decider. In the final game Tampa’s Ruslan Fedotenko scored in the first and second periods to give the home team the lead, before Calgary’s Craig Conroy scored a consolation goal in the third. The Bolts were Cup champions. Pickings were slim in the following two seasons, the Lightning made the playoffs both times but were knocked out in the first rounds. The following season, they finished fifth in the division and mised the playoffs. Tortorella’s time had run out and he was fired. Subsequent seasons were calamitous. The ship was temporarily steadied by the appointment of new head coach Guy Boucher, who took the Lightning to the Conference Final in 2011, only to lose in seven games to Boston. The Boucher redemption lasted exactly one season, the Lightning missed the playoffs in 2012 and was fired in 2013. Boucher’s appointment coincided with the appointment of former Red Wings team vice president, and trade genius Steve Yzerman as General Manager. Yzerman immediately made his mark by extending St. Louis’ contract and bringing in Simon Gagne. The impact wasn’t immediately felt but Yzerman’s appointment of Jon Cooper as head coach brought the team together into a unit perfectly designed to defeat the Red Wings in playoff games. 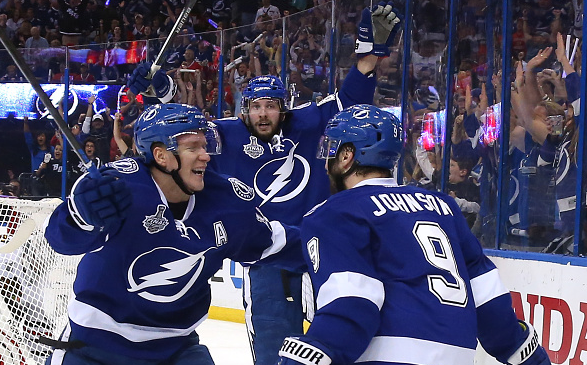 2015 brought the Lightning their second playoff finals, although it would not be a repeat of 2004. The Chicago Blackhawks won the series 4-2 to lift yet another cup. Previous Post: Who Should Pay For Calgary’s New Arena?